The syn1588® NIC Box from Oregano Systems simplifies using PTP. Without any hardware or software installation one can run a full featured IEEE1588 node out of the box. We simply put everything together required for a reliable accurate PTP node. A Linux based PC in a 19” 1HE case holding the famous syn1588® PCIe NIC. All required software is pre-installed and pre-configured. One just needs to connect the syn1588® NIC Box to mains and to your network. That’s all. The front panel display of the syn1588® NIC Box informs you about the basic parameters and status of your PTP node. Thus, one would not even need to connect a monitor or remotely login to the unit. If you require a PTP node but do not want to install hardware, software, drivers: The syn1588® NIC Box is a easy to use pre-configured PTP node. It’s 19″ rack mount case allows easy integration in your server environment. Just plug in mains and the network cable; that’s it. 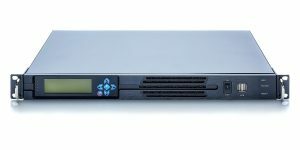 If you need a SMPTE ST2059-1/2 compatible node including generation of video sync signals: The syn1588® NIC Box is a simple to use pre-configured PTP solution ideally suited for SMPTE time transfer applications. Oregano Systems proven syn1588® technology is driving the standard for these applications. The syn1588® NIC Box is a highly versatile, high performance PTP node capable of delivering a variety of precise timing signals. Aside from a standard 1 pulse per second, two arbitrary frequencies as well as an IRIG-B signal can be generated. It is designed to receive or transmit timing information over an Ethernet network using the Precision Time Protocol (PTP) defined in IEEE 1588-2008.